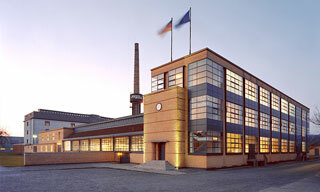 Fagus Factory in Alfeld is a 10-building complex - began around 1910 to the design of Walter Gropius, which is a landmark in the development of modern architecture and industrial design. Serving all stages of manufacture, storage and dispatch of lasts used by the shoe industry, the complex, which is still operational today, is situated in Alfeld an der Leine in Lower Saxony. With its groundbreaking vast expanses of glass panels and functionalist aesthetics, the complex foreshadowed the work of the Bauhaus school and is a landmark in the development of architecture in Europe and North America. This article uses material from UNESCO World Heritage List article "Fagus Factory in Alfeld", which is released under the Creative Commons Attribution-Share-Alike 3.0 IGO License.